What is the AromaTouch® Technique? The dōTERRA ArōmaTouch Technique is a clinical approach to applying essential oils along energy meridians and visceral contact points of the back and feet to help balance sympathetic and parasympathetic nervous systems of the body. 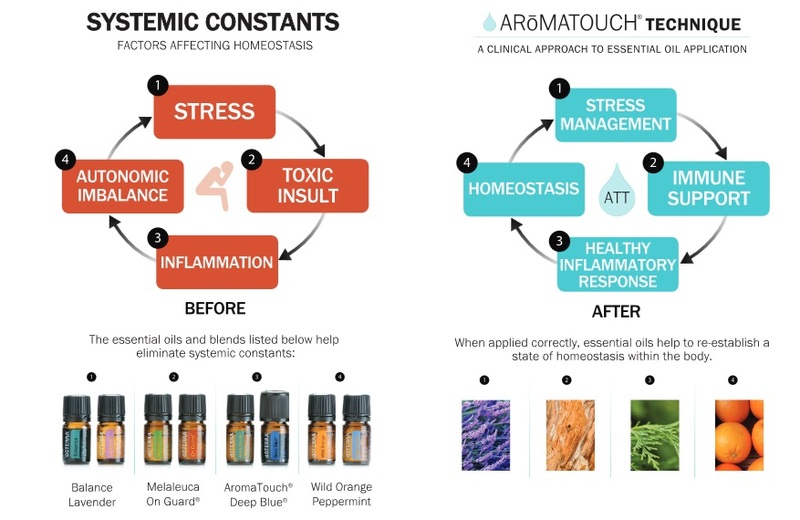 Developed by Dr. David Hill, a leading expert in integrative medicine and therapeutic applications of essential oils, the ArōmaTouch Technique improves well-being by reducing physical and emotional stressors and by supporting healthy autonomic function. The technique is simple and intuitive and uses dōTERRA CPTG Certified Pure Therapeutic Grade® essential oils for an unparalleled grounding experience. The ArōmaTouch Technique includes four primary steps designed to minimize systematic stressors to autonomic balance. Each step includes the application of two essential oils or essential oil blends specifically formulated to support healthy emotional and physiological functions for well-being. The technique requires between 40 – 50 minutes per application. Book you Aromatouch Treatment today! Host a class and receive a free Aromatouch Treatment!